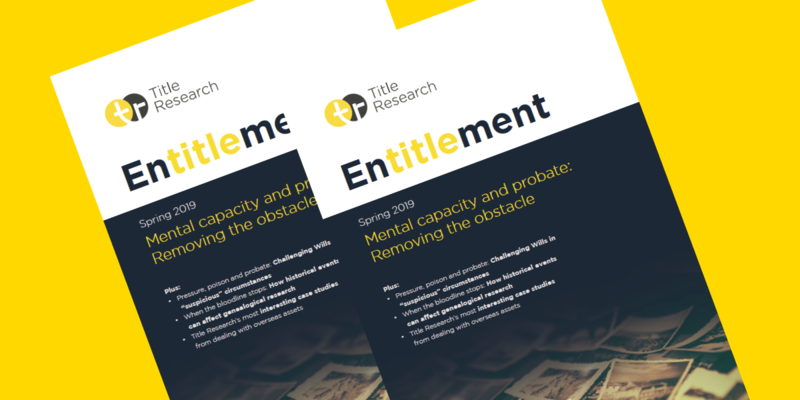 In the spring 2019 edition of Title Research's news digest, Entitlement, Tim Farmer, one of the UK's leading experts in the assessment of mental capacity, discusses how we can remove the obstacle between mental capacity and probate. This issue also features an article on challenging Wills in "suspicious" circumstances from Barrister Ewan Paton of Guildhall Chambers. In addition, we share how historical events impact genealogical research, some interesting asset repatriation case studies, and how you can get specialist support for estate administration. Download your free copy of Entitlement here.